That is one chunky rifle. Just the thing for squirrel hunting. This casting of a Solothurn doesn't do much for me. Most of the things I would look for as visual recognition points don't seem to be present, or if present don't seem to be prominent. 1) Wheeled carriage. OK yes it could be removed. So it is not a necessity. But it is a fairly unique mark of the Solothurn gun. So why not put it in the casting? 2) Cylinder above the barrel -- I don't actually know if it was a recoil damper or recuperator. The cylinder was quite a prominent feature of the gun. When mounted on it's bipod, I believe the cylinder reached almost all the way to the bipod. It makes the gun look altogether more massive than this model appears to my eye. 3) Complex barrel assembly. The barrel of a Solothurn in general should not just look like a long pipe. It's a fairly complex assembly, recoiling in to the larger base assembly (telescoping), with the bipod (when mounted) placed at the junction of inner and outer assemblies, and with a significant flash hider. When combined with the recoil cylinder (above), the first part of the gun should be quite massive compared to the barrel jutting out at about the point of the bipod. 4) Magazine. This may just be the pic. The magazine extends from the left side of the receiver, IIRC pretty much right above the pistol grip / trigger. Makes the gun look awkward to shoot rifle-style, at least to my eye. This is a less significant issue than the three above, but contributes to the distinctive look of the gun. Maybe it's the pic. But I just don't look at that and say "Oh look, that's a Solothurn". 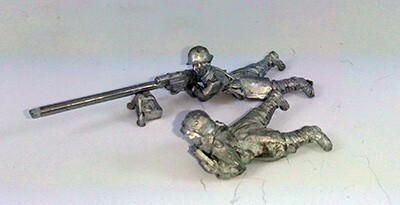 Even at my scale (6mm) I'd be a bit disappointed with such a plane pipe-on-a-bipod. I think i see the magazine. The barrel doesn't look right though. There are a lot of pictures of them being fired from the bipod, so the wheeled carriage is not essential. Also depends what model they are trying to depict. The S18-100 or S18-1000. The S18-1000 doesn't have the recoil cylinder. Agree however it is not a great sculpt. Would probably replace it.